I was thinking this morning.... about yellow. I was in the midst of a mixed group of persons recently, when I heard a guy call out to another in a manner I have not heard in a long while. He had said, 'Yellow, please come.' Since I grew up in Nigeria, I knew 'Yellow' was not his name, but a call-name for a light complexioned person. A light skinned man or woman in Nigeria is described as a yellow man or woman and if the person is extremely light, he or she is called 'yellow pawpaw.' This moniker was so common in those days that there was a song, a classic released by Kofi Sammy in 1995, that goes like 'Yellow Sisi dey for corner; Put e hand for jaw; Na wetin dey cause am o; Na money palava.' Hmm!!! Only those born before the nineties will understand. As I wondered if describing someone as yellow was limited to Nigeria, I found out that in the early 20th Century, 'High yellow' was a term sometimes used to describe light skinned African-Americans, even though I am at a loss as to the reason for the 'high' before the yellow. The Business Insider revealed why yellow is the most preferred colour for taxicabs worldwide and the reason is because yellow cabs have fewer accidents. The have few accidents because yellow cabs are easier to see and therefore have a lower chance of being hit. Trust me, this was backed up by research. But if this is true around the world, why is it different in Nigeria? 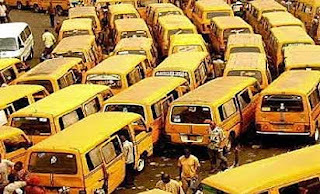 Why are the yellow cabs, danfo and molue, in Lagos so badly dented? My thinking is that most of the Nigerian drivers are, amongst other factors, distracted by the many yellow ladies that have taken to standing along the road for reasons best known to them. Believe me, I am not furthering the cause of 'yellow journalism' by my line of thought, I am only pointing out that yellow by itself is an attractive primary colour but if you mix it with magenta, you will see red, like many Lagos drivers have. As I made up my mind to wear this nice yellow tie this morning, I remembered an old time joke in the years preceding mobile phones, where a local boy was asked to make a sentence with three colours. The boy stood up and confidently said, 'Yesterday in my uncles's house, the phone ring 'green,' and I 'pink' up the phone and said 'yellow.' Feel free to smile and have a yellow-filled Sunday.